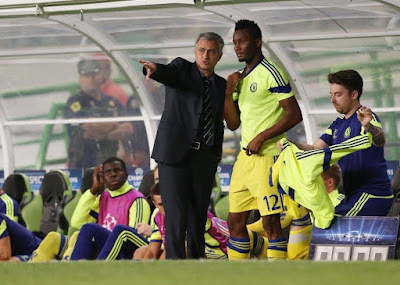 The Sun UK newspapers has published a shocking report, saying Jose Mourinho intends to sign Chelsea and Super Eagles midfielder John Mikel Obi in January. Mourinho feels Mikel, who has a few months left in his Chelsea contact, will help improve Man U’s midfield and is prepared to sign him in January when he knows he’ll come cheap. Read the full report, after the cut. Now the Man united boss is ready to take advantage with a cut-price New Year offer for the player the Red Devils thought they had signed ten years ago. Mikel had just turned 19 when the Old Trafford outfit announced on their website that they had signed the teenager on a four-year contract from Norwegian club Lyn Oslo. The £4million transfer was done directly with the player and his club — bypassing his agents and he was even pictured in a United shirt. But Chelsea angrily claimed they had an agreement with the agents to buy him. It was reported Obi started to get threatening phone calls and ended up having to take refuge in a safe hotel with a security guard. If the deal is successful, this will be the second time Mourinho will sign Obi, who he believes can play in a defensive midfield role in front of the back four.